We each have our own favorite chili recipe if we like chili. 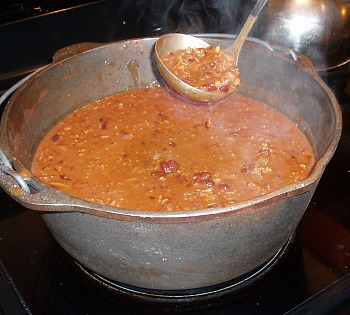 It could be with beans or without beans; it may be with a certain type of meat like sausage chili, it could be a combination or even without meat. Perhaps we might like special seasonings and of course many of us won’t eat chili without hot peppers of some kind. 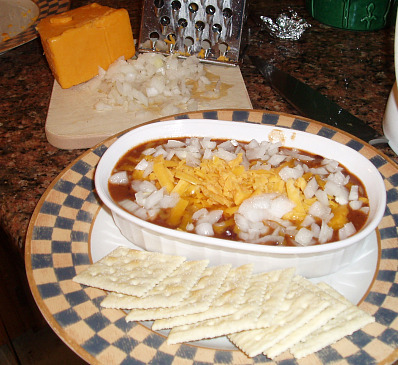 It is interesting to talk to people about this topic; one is always surprised at unusual ingredients that are added to a favorite chili recipe of some people like the beer chili recipe. Even the cooking methods are interesting whether it be over a campfire, in the oven, on top of stove or a slow cooker chili. Most chili recipes work well in a slow cooker, especially the ones which require long cooking time. My chili has coarsely ground low fat beef and beans as the main ingredients. I like the beans in it so I add one can. I take another can and put them in the blender. They make a thick sauce which adds to the flavor and texture of the chili. If you do not like beans in yours, try this recipe using only the one can of beans that is blended for thickening. I also love the flavor of garlic. If you will notice I have added fresh garlic and a little garlic powder. I also like green bell peppers so I add them. Some people do not like the flavor of these peppers. This is why I made up the list on the how to make chili recipes page for you to pick the ingredients you like when making your chili. 2 Cans kidney beans (30 ounces each) With blender, blend 1 can until almost smooth and thick. Spray a heavy kettle with oil. Cook beef, onion and bell pepper until beef is done. Add fresh garlic, tomato paste, tomato sauce, beans, garlic powder, chili powder, red pepper and stir to blend. Stir to blend on medium low heat. NOTE: Stir frequently and make sure it doesn’t stick on bottom and burn due to thickness. Season to taste with salt and pepper. Cover and simmer on low heat for 30 minutes. In a heavy pan heat the oil. Add the meat, onion and garlic. Cook until meat is done. Add all other ingredients. Heat mixture on medium heat. Reduce heat to low, cover with a lid and simmer for 1 ½ to 2 hours. Stir frequently and be careful mixture does not burn on bottom. 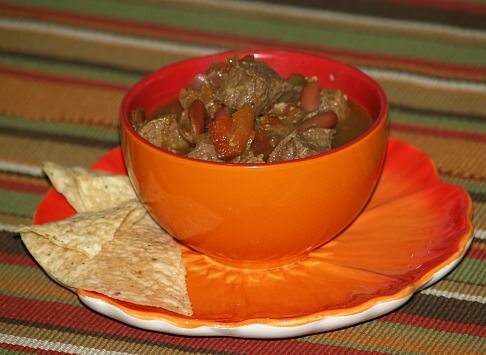 Brown beef in a large chili pot; remove excess fat. Add all other ingredients stirring until well blended. Bring to a boil, reduce heat and simmer on low 8 to 10 hours. Brown meat, chopped onion and garlic in a large pot. Add tomato juice, tomatoes, beans, bay leaves and chili powder; bring to boil, reduce heat and simmer 30 minutes. Add rice, water, salt and pepper; simmer 1 hour.